Kings Mantle (thunbergia erecta), also commonly known as Bush Clock Vine is a tropical shrub native to Africa belonging to the acanthus familily aka 'acanthaceae'. If you are lucky enough to live in a frost-free climate, you can safely plant Kings Mantle outdoors with winter protection as required should the temperatures approach freezing. It will freeze at about 28F, but will usually come back the following season unless a severe, lasting frost was encountered. In the more northern areas, the plant adapts well to container growing and you might try one on your patio and let it spend the winter months in the garage or enclosed porch. This is a lovely compact shrub with attractive shiny small-leafed foliage. It can be grown as a specimen, attaining heights 4 to 6 feet. It will make a dense, nearly evergreen hedge in a relatively short time, and because growth is slender, it can be kept trimmed to suit. However, you will sacrifice most flowers because it blooms on new growth. The eye catching flowers are 2 to 3 inches across consisting of a creamy white tube with petals of a rich dark purplish blue and dark yellow throats which somewhat resemble morning glories. It will bloom in great profusion, the individual blossoms being mostly single, but often are borne in small clusters. It has a faint but pleasant scent. There is also a pure white variety (thunbergia erecta alba). Kings Mantle will grow and bloom in partial sun to partial shade and ordinary but well drained soil. Although somewhat drought tolerant, liberal watering and an occasional dose of fertilizer will keep it lush. The plant is very easy to propagate by means of ripened softwood cuttings. Take 4 to 6 inch cuttings before flower buds appear, if possible. Strip the bottom 2 inches of foliage and insert directly into a good seedling mix. Keep moist, but not soggy, and you will see new roots within 2 to 3 weeks. At this point, they can be moved to individual pots. If you pinch back new growth occasionally, they will grow more bushy and you will have good-sized plants in no time. Thunbergia alata - the common black-eyed susan is a twining perennial which can attain lengths of up to 8 feet. It is used mostly for hanging baskets and has buff colored flowers with dark purple centers. There is a white and also an orange variety. Thunbergia coccinea - a spectacular tall climber bearing scarlet flowers with yellow centers. Thunbergia grandiflora - another tall climbing variety with large heart-shaped leaves and blue bell-shaped flowers. 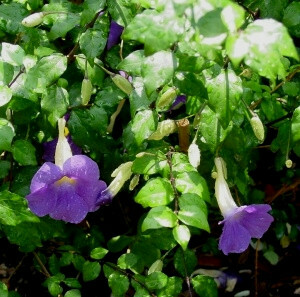 Thunbergia laurifolia - produces clusters of large pale blue flowers - popular in greenhouses where it will bloom in the winter months. All are easily propagated by cuttings or layering. They will also grow readily from seeds which may be available in your local garden center or can be ordered from various seed catalogs.